Can we replicate Denmark’s success story? Last week I gave an anecdotal explanation to Denmark’s happiness. To complete the story, today I would like to ask what the Danes think themselves about their high levels of happiness, and whether it’s a success can be replicated elsewhere. What do Danes think themselves? If I believe what Meik and Marie Louise from the Happiness Research Institute say, I get the impression that Danes find the interest in their high happiness levels amusing and comical. Danes tend to point at what is not good in Denmark: mental health issues and depression, a complex relation with immigrants, a reputation of not being too outgoing. Part of the disbelief, says Meik, may have to do with the fact that ‘lykke’, the Danish word for ‘happy’, is a term for quite an extreme term. Jante’s Law in mind, it’s probably to say that things are not bad than that they are amazing. Can we replicate Denmark’s success? Urban design. Certain factors in the design of a city are related with the happiness of its citizens. A city like Copenhagen is easy to navigate, has green spaces close-by in various neighbourhoods, and can be travelled by bike. This allows people to get around easily and to be active, and the example can be followed elsewhere. 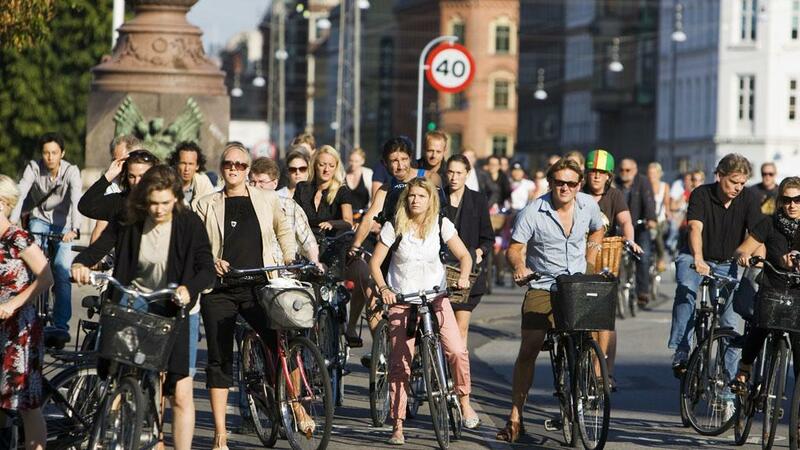 The term ‘Copenhagenize‘ has already been used to drive the use of bicycles into other cultures. Work participation. I believe work-life balance (also cited in the Happy Danes report) is an important factor in Danes’ levels of happiness. Acceptance of flexitime and working from home, subsidised creches and generous maternity leave, a full year to be divided by the two parents) are helpful. This allows people to pursue a career and benefit from the overall positive impetus for happiness levels of work, whilst maintaining a meaningful relation with growing children. Strive to take away barriers. Kristian mentioned he does not have to worry about healthcare or education. If such services are accessible for all, this can prevent worries resulting in unhappiness. In other countries, such as the US, the belief that it’s people’s own responsibility to reach success in life is a barrier in the pursuit of happiness. Without wanting to sound like a communist – if US politicians want to increase quality of life, raising taxes to decrease the cost of health and education may provide part of the answer. This guest post has been written by Sanne van der Beek. An earlier Dutch version of this article was published at the blog of Stadsleven, a monthly talk show about city life in Amsterdam. How do you measure something as subjective and diffuse as happiness? And: is it possible to determine what is the happiest place on the world? New technologies like Twitter and iPhone apps come the rescue. The Hedonometer for instance analyses the happiness levels from words in English tweets. In order to do so, the researchers have scored the 10,000 most used words from Google Books, articles in the New York Times, song lyrics and twitter messages on their happiness level. It won’t be a surprise that ‘laughter’ scores a lot higher than ‘killed’ or ‘bored’. Even words that are less closely linked to emotion have been ranked. ‘Rainbow’ takes home 8.06 out of 9; alcohol doesn’t get more than 5.2. Hedonometer’s analysis of the US. Hawaii is the happiest state, Lousiana the least happy one. Every day, Hedonomoter analyses the presence of these words in 50 million tweets from around the globe. Together, these tweets form a daily ‘happiness average‘. In this way, you can measure the happiest day of the year, or the average level of happiness per state. Mappiness is a free iPhone app conducting the largest research on the influence of environment and community on human well-being ever. Since 2010, the app has been downloaded by almost 60,000 people. How does Mappiness work? At irregular intervals, the app asks you about your state of being. The app also wants to know exactly where you are, and in whose company. The choice amongst forty options takes about twenty seconds, and must be made within one hour to be classified in the results. Initial results from the London School of Economics on the basis of over 3 million data points demonstrated that people are somewhat happier in nature, forests or at the coast than in urban environments. Sanne’s entire dossier (in Dutch) ahead of Stadsleven’s talk show on The Happy City can be found here. I contributed an article on the lessons from Bhutan for the Happy City (English translation on my blog). After the event, I wrote a post about the conclusions of the panel: compactness, connections, trust and design are the winning factors for happy cities! What makes a city happy? What can local politicians and urban planners can do to promote a city’s happiness or well-being? These were the key questions at the talk show Stadsleven’s (‘City Life’) session on ‘The Happy City’ in Amsterdam. The talk show higlighted lessons for cities worldwide. The speakers had a four different answers to the question “what makes a city happy?”: compactness, connection, trust, and design! The first speaker was Paul Schnabel, a well-known sociologist. He commented on a BBC article labelling Utrecht as the happiest city in the Netherlands. Schnabel agreed that happiness levels in Utrecht would be high and attributed this to the fact that it is a compact city with a large variety of people and activities. All elements important to city life, like shopping, culture and nightlife, are available within its small inner city. Utrecht’s inner city is under pressure though: it hosts 30,000 inhabitants and serves as the primary city centre for several hundreds of thousands of people from the surrounding areas. 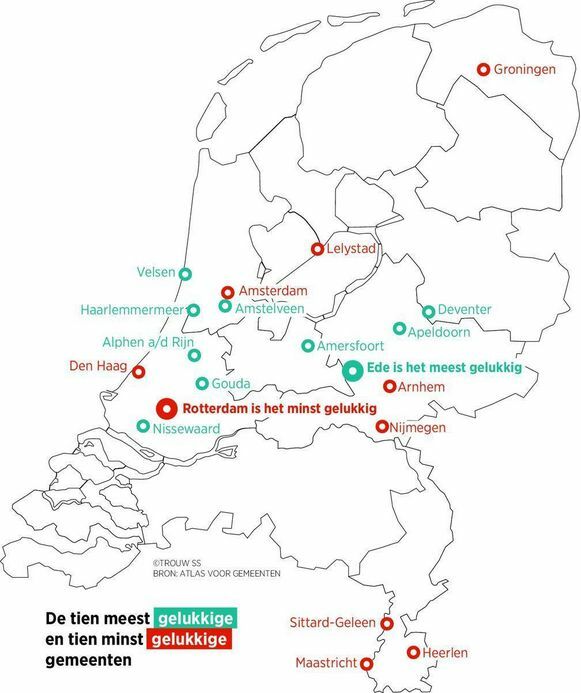 But why would Utrecht be happier than Amsterdam, which offers even more of the same? It’s not scale: it’s the fact that Amsterdam is perpetually flooded with tourists. (This is no surprise if you’ve ever heard an Amsterdammer complain about the non-existing cycling skills of ordinary tourists). Brussels, in practice, is composed of compact neighbourhoods, like Etterbeek, Ixelles and St. Gilles – a recipe for happiness? Interestingly, beauty was not a factor mentioned by Schnabel. Charles Montgomery, a journalist and the author of The Happy City, didn’t focus on this aspect either. He emphasised the importance of connections. Not only the personal connections to other people which are so determining for happiness, but also the physical connection between areas of the city. He cited the example of Enrique Penalosa, a former mayor of Bogota, which I mentioned in a previous post. Penalosa tackled challenges in Bogota, such as crime, social inequality and lack of education, by changing the transport system. A car-based system that separated the haves from the have-nots was replaced by a well-established bus system. This allowed all citizens, regardless of their wealth, to connect to every part of the city, and to go to schools, hospitals and parks in other areas. Montgomery saw a task for urban planners to design spaces for human interaction. He even mentioned what the ideal depth of a front yard is to facilitate the shallow conversations with strangers about the weather: three meters. If it’s more, people hide behind their fences; if it’s less, they don’t feel at ease sitting in their gardens too close to passers-by. If meeting people is so important, is there a role for government to create meeting places or to actively bring people together? There might or there might not. Host Tracy Metz highlighted the importance of the ‘trusted stranger’: the person you encounter in a non-descript place like a copy shop, but hardly talk to. However, seeing the same person around somewhat regularly creates a level of familiarity. (At the second thought, I could maybe use a copy shop or two in Ixelles). This establishes a basic level of trust needed to feel comfortable in an area. Indeed, happiness is often associated with trust. Denmark’s high happiness levels may come as “we hate our politicians but we trust them”, as a business man says in this investigation in Copenhagen’s happiness. Compactness, connection and trust all count, but doesn’t beauty have a role to play? ‘Positive design’ professor Pieter Desmet of the TU Delft believes that designing beautiful products can help. But products have to appeal to the emotions of the consumers. At the same time, they have to take into account that the material goods lose their powers quickly, as consumers adapt to them. Products can never be a source of continued happiness. But design can create new positive experiences in the city’s architecture. That is what Desmet teaches his students. Wish to read more about ‘the Happy City’? Sanne van der Beek, the editor of the talk show, has compiled an amazing dossier with articles, images, videos and links about the Happy City (including a guest post by undersigned). Nowadays, when you have a blog, you don’t call yourself a blogger. No way. Your title at least is editor, or, to take it a step further, curator. A long time ago, only museums had curators. Then, theatre groups followed. Nowadays, the organisor of a conference is called a curator, and the catering manager curates food. Anyway. One of the good things of this blog, apart from the fact that it makes me happy, is that friends are regularly sending me great articles about happiness. There are so many great stories of happiness that deserve to be shared, and I can’t always keep up with weekly posts… Therefore, this post brings some of those together: happiness. Curated by you. Happiness and education – curated by Kasia. Logan LaPlante is not your typical 13-year-old. He has long hair and a hat, loves skiing, and confidently says profound things on the TEDx stage. His argument is very simple: real learning comes from a radically different approach, far beyond the traditional education system. By creating a lot more space for discovery – ‘hackschooling’, as he calls it – we can learn how to make ourselves happy. Why doesn’t our education system teach us that? Material mass unhappiness – curated by Maria. Materialism promises satisfaction. It delivers despair. That is the main message of a great piece by Guardian writer George Monbiot under the title ‘One Rolex Short of Contentment‘. 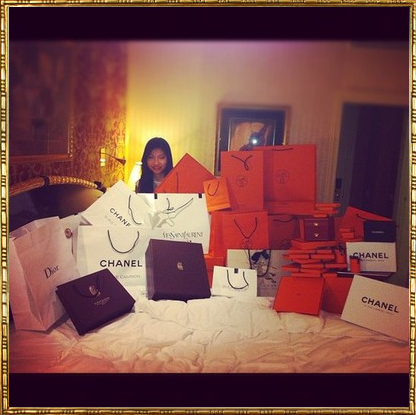 The sarcastic remarks are illustrated with unintendedly hilarious pictures from the Tumblr ‘Rich Kids of Instragram‘. Customised car seats, tiny dogs, ridiculously expensive watches, that kind of stuff. Citing several studies, Monbiot also has a serious message: research demonstrates that there is a causal link between materialism and lower levels of happiness. One example are the developments in Iceland after the crisis researched by Tim Kasser. After the financial crisis, some people focused on material goods to recover lost incomes; others dedicated themselves to family and community values. The well-being of the second group increased. Monbiot’s conclusion is simple: material aspiration is a formula for mass unhappiness. Image found in Monbiot’s article; original source Rick Kids of Instagram. How to build a happy city – curated by Eva. Some time ago, I already stumbled upon a piece by Charles Montgomery, author of Happy City. Very comforting to a Dutchman, his article seemed to back my claim that cycling to work brings happiness. Montgomery stated that for a single person, exchanging a long commute for a short walk to work has the same effect on happiness as finding a new love. On the BBC Future blog, Daniele Quercia takes it a step further. Architects are trying to build smart and efficient cities. But they are functional people and interested in how people use space. What would their design look like if instead, they’d wonder how their work makes people feel? Quercia cites the case of Bogota, where residents felt more optimistic on the day the mayor decided to ban cars from the streets for 24 hours. She also mentions work by Yahoo Labs, concluding that cars are associated with sadness. But smart cities are not just walkable. It’s about identifying the happiest places in a city, and creating routes to connect them. Time for some well-deserved Christmas holidays! I’ll be back on the first Monday of the New Year.